There’s something so hauntingly beautiful about autumn that cannot be denied. The chilling fog rolls through the streets in cloudy blankets. The trees shed their verdant greens for softer shades of orange, brown, and yellow. Pumpkins adorn the front porches of old houses in old neighborhoods. After a long and extravagant summer, people are returning to their roots, cozying up at home, and reveling in the abundance of life. As of September 22, 2018, it’s the launch of harvesting season, and these zodiac signs will have the best fall equinox: Libra, Scorpio, and Pisces. 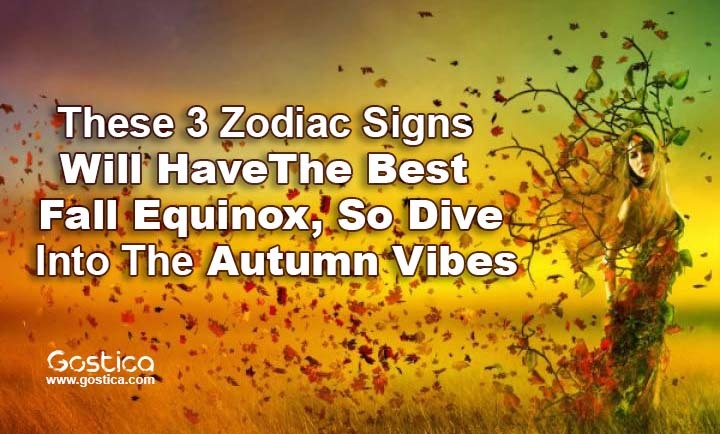 Remember that you’ll also experience just as much autumn amazement if your rising sign falls under any of these signs. As you probably already know, each of the four seasons has their own unmistakable influence over our lives. While the summer is about nurturing our intentions so that they grow, autumn is about reaping the rewards of our growth through a form of spiritual harvest. It’s when you are meant to take a long look at the work you’ve done so far and revel in all that you’ve come to accomplish. Before we set these intentions free during the death of winter and plant new ones through the reincarnation of spring, it’s time to feel proud of the person you’re quickly becoming. The autumn equinox is synonymous with one of the most incredible days out of your entire year: the start of your solar return. When fall begins, so does Libra season, automatically crowning you astrological royalty the moment it begins. Your solar return is about taking a long look in the mirror and feeling proud of all that you’ve accomplished in the last year. How have you grown since your last birthday? Is your life any different than it was during this time last year? Chances are, the amount of growth you’ve experienced is truly infinite. Even if these changes are as simple as a shift in your attitude, a renewed perspective of life, or an undeniable feeling that something is just “different,” then it’s clear you’re on the way somewhere beautiful. Revel in everything about the person that you are and feel free to shout your pride from the hilltops. There’s no better time than now to scream self-love and confidence. With Venus — planet of love, romance, luxury, and affection — in Scorpio when the autumn equinox takes place, it’s sure to be a day of astonishing passion, intense joy, and vivid thoughtfulness about the present moment. Your connection not only with others, but also with yourself, is forged with unbreakable iron, and the autumn equinox brings you even closer to your truest self. It also happens to be the same day that the sun enters your 12th house of spirituality, initiating a period of magical solitude and daydreamy peacefulness. You’re preparing for your solar return on October 23, so use this time to realign your chakras, set any negative emotions free, and absorb positive light in its place. Do whatever needs to be done to heal yourself and get back in touch with your spiritual center. When the autumn equinox begins, the moon will be a waxing gibbous in Pisces, filling you with bottomless energy and an intrinsic connection to your rawest self. This will be the final stage before the full moon in Aries on September 24, and the energy in the air will match everything about you once the season shifts from summer to fall. Your dreams will become more vivid, your intuition will be sharpened, and your perspective of the world will seem positively magical. Revel in the moon’s glow as it takes your hand and guides you through the beginning of this next season. For you, fall will be a time of deep healing, intense growth, and the banishment of your fears. While none of these things are easy, they’re essential to helping you become the best person you can possibly be. However, on the day of the equinox, the cosmos will remind you that everything will always be OK in the end.